We probably don’t need to introduce taxi sharing apps such as GrabTaxi much on Vulcan Post anymore, as many readers would be already familiar with them. Third party taxi booking apps have been doing reasonably well in Singapore, and we recently wrote that these third party taxi booking apps are giving taxi operators in Singapore a run for their money: many taxi drivers in Singapore are actively adopting and using GrabTaxi and Easy Taxi to get jobs from customers. Terence Lee, editor of Tech in Asia, recently had a conversation with a Singapore taxi driver who is a GrabTaxi driver, and the conversation revealed some interesting insights about GrabTaxi, arguably one of the most popular taxi booking app in Singapore right now. In case you are unfamiliar with GrabTaxi, the mobile app allows you to enter your current location and flag a taxi to your pickup location. Certain added features included in the apps include booking history, live feed of where your taxi is, as well as a taxi driver review system. Officially launched in Malaysia as MyTeksi in June 2012, GrabTaxi was founded by two Malaysian Harvard Business School graduates. It has been downloaded over 1.2 million times by users in Malaysia, Thailand, Vietnam, the Philippines and of course, Singapore. 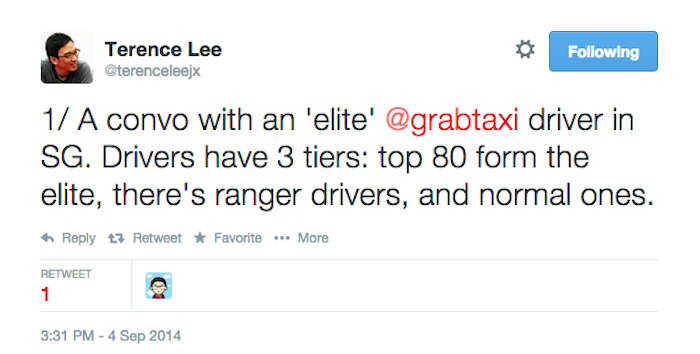 According to the conversation between Terence and the driver, GrabTaxi drivers are divided into three tiers: the top 80 form the elite tier, and followed by ranger drivers and the normal drivers. 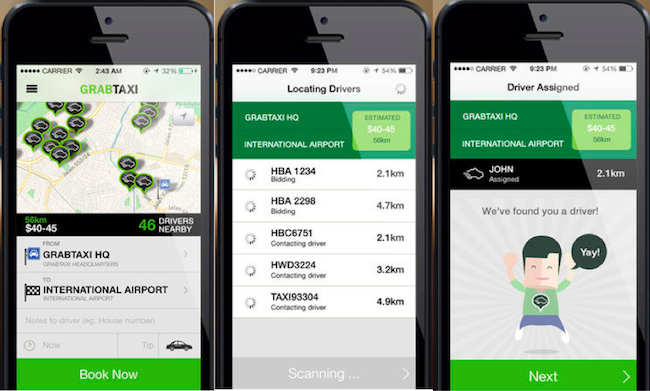 According to the elite GrabTaxi Terence spoke to, GrabTaxi is the top taxi app in Singapore. “A 75-year-old passenger booked the taxi herself. Crazy demand when raining.” – elite GrabTaxi driver. 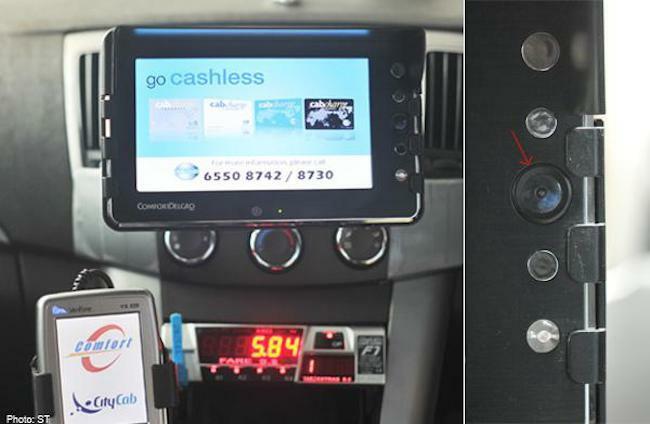 The driver also shared that GrabTaxi steals businesses away from Comfort, one of the main taxi operators in Singapore. It is harder to get bookings via Comfort’s hotline and SMS as drivers prefer GrabTaxi. This is in line with what we previously wrote: the biggest draw for taxi drivers is this: third party taxi booking apps allow taxi drivers to see where the customers are headed to. Though customer taxi booking requests are routed to the traditional taxi operator dashboard mounted inside the taxis, taxi drivers do not have access to the destination of the customer. They only know the pick up location. This is inconvenient for drivers especially when they are planning to change their shifts. If they accept a job request only to pick up a customer who is headed at the different direction, it would be a wasted trip. With third party taxi booking apps, taxi drivers have an overview of all the job requests, along with their pick up locations as well as the drop off points – the missing piece of information which taxi operators never managed to provide taxi drivers all these years. 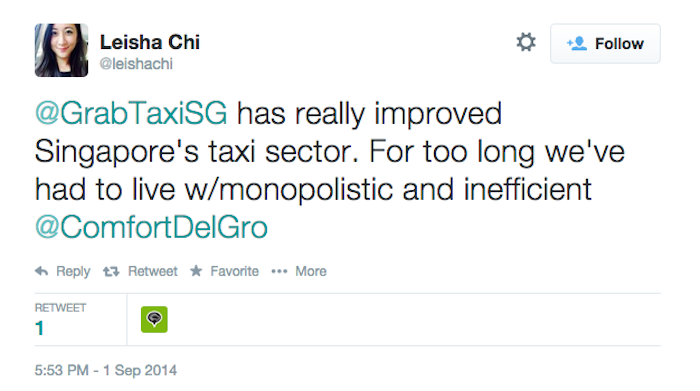 According to Terence’s tweet too, Singapore’s Prime Minister and LTA are happy with GrabTaxi so far. 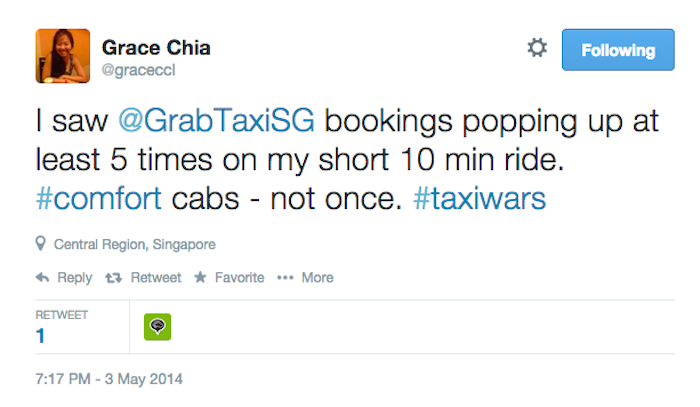 The reason is simple: LTA gets less complaints for lack of taxis now. So how did GrabTaxi manage to win the popularity among taxi drivers? The GrabTaxi driver whom Terence spoke to revealed that before the app was officially launched, students were hired to sign up taxi drivers at the neighbourhood coffeeshops where the drivers normally hang out at. There were also cash incentives for all GrabTaxi drivers when they hit a certain number of jobs. GrabTaxi also leveraged on smartphones: as most taxi drivers are familiar with it, it is easier for taxi drivers to just download and use the app: they had nothing to lose. For customers and riders, GrabTaxi waived the taxi booking fee (S$3 or US$2.40) for customers in Singapore at the start (for about one month). This generated some hype and awareness among customers and kickstarted the use of the app among Singaporeans. It also had a free ride day for new users on the 9th of June earlier this year. Of course, when enough taxi drivers sign up, the pent up demand can easily be met, and with happy customers, words of GrabTaxi soon spread on social media. When we spoke to our friends for our weekly Apps I Live By series, we found out that most of them use GrabTaxi too. Joseph, CEO of popular dating app Paktor also went all the way to say that GrabTaxi is the “best taxi app in the region”. With a high adoption rate, don’t be surprised if there are no taxis available to pick you up when you call in and request for a taxi through the hotline, because they are most probably all busy chauffeuring customers through GrabTaxi and Easy Taxi, its main competitor. We are waiting to see if taxi operators introduce any measures or innovation to customers who might not be familiar with taxi booking apps just yet. Singapore Might Be Getting Another New Taxi Booking App Soon!